THIS UNIT WAS INSTALLED IN LOWER INSIDE HELM. IT IS IN EXCELLENT COSMETIC CONDITION. Furuno Radar Cable - 1832 1833 1834 1932 1942 RW8577-3. Condition is Used. Cable was in working condition when removed from boat as part of electronics package upgrade. Used Furuno MU-155C 15" Marine Monitor, 1 DVD, 2 VGA, and 3 Video inputs. The unit is in good working condition, Included with the unit is a power cable, And a suncover. furuno radar display unit model 1932 Mark 2 RDP-118. Condition is Used. Good radar display, I do not have the power cables Shipped with USPS Retail Ground. Front Mount Kit, MFG# 001-337-450-00, for TZTL15F Multi-Function Display. Furuno RDP-149 10" Navnet VX2 C-MAP NT Max Display Marine Radar. No mounting bracket. No Power cable and no other cables included. No SD card included. No SD card door. The unit is sun faded and has scratches. You are buying one cover that fits the RDP 139 or RDP149. Used to connect the DFF1 & DFF3 to VX1 and VX2 displays with 6 pin connections. This service takes an average of 2 weeks, but may take longer. An extension must be requested in writing and approved by Max Marine Electronics. FURUNO 1731-MARK 2 RADAR DISPLAY. 1731-MARK 2 DISPLAY. WORKS VERY GOOD! What is included is the 7" crt display, the hood with magnifyer, power cable and mounting bracket. Furuno FS-1502 SSB Marine Transceiver WITH AT-1502 COUPLER! Furuno FS-1502 SSB Marine Transceiver Includes AT-1502 COUPLER! Condition is Used Ready to install Includes original owners manual pages Will ship with full insurance. This is a Furuno CH-250BB Searchlight sonar in great used condition. We ran a full test on the unit to ensure proper function. This unit is mostly complete. This is a single frequency 150 kHz unit. Unit works just removed to upgrade included antenna and power cord NO transducer it was damaged. sale is as is was working when removed. Furuno GP-1650F Combo GPS Marine Boat Color. Condition is Used. Shipped with USPS Priority Mail. ◦ NAVnet vx2. • fits Furuno models. ▪GD1920C GP1920C. ▪1824C 1834C 1934C 1944C 1954C 1964C. ◦ appearance varies from photo. Make Supersized seem small. Get images that. In the rare event of a problem, I can usually correct it quickly. This is a used display removed from a boat during an upgrade. It has been tested and works great. It was removed from an overhead electronic box, so it was never in the sun. You are buying the display only. Airmar 1 kW Transducer Mix and Match Cable 33' Long With Furuno 10 Pin Connector. Airmar Part # MM1-DST-10F. Although all Mix and Match transducers are sold with the appropriate cable needed for installation. Previously installed but never used on vessel. Furuno RDP-148 VX2 7" COLOR RADAR PLOTTER Navionics SD version No external cartography Condition is Used Screen in great condition Comes with power cable and mounting bracket/knobs as well as OEM plastic suncover FREE SHIPPING!! It was fully tested on our bench. An extension must be requested in writing and approved by Max Marine Electronics. Your warranty will be void and we will not repair anyone else’s failed attempts at repairing your electronics. 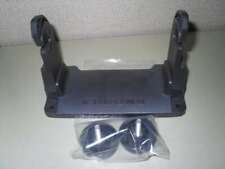 Furuno 100-323-981 or 100-323-982 Mounting Bracket NAVNET RDP-131,RDP-148, 1724C, 1734C with KNOBS. Airmar MM1-DT-10F Airmar to Furuno 10 Pin 1kW Transducer Mix and Match Cable 8m. Brand new thought I needed this and did not. Never used or installed. Furuno Navnet VX2 BB Processor. This processor works with C-MAP Charts. Trending at $416.66eBay determines this price through a machine learned model of the product's sale prices within the last 90 days. Transducer Features. 50/200 kHz. Bronze Thru-Hull. Any requests for this type of service will be ignored. This service takes an average of 2 weeks, but may take longer. Other Policies. The Transceiver Unit is Type DS-810. The Distribution Box is Model DS-80 Type DS-801. Digital photographs are taken. FAX-30 weatherfax module - Great Condition. We acquired this from a boat being refit with all new electronics. It has been tested on a Furuno Navnet VX2 display (DISPLAY NOT INCLUDED), working as it should. Furuno TZT14, Multi-Function Display. The LED backlighting pushes light through every pixel on the screen for remarkable brightness. Anti-reflective glass coating is visible under any lighting condition. 165T-50/200-TM260 Transducer for DFF3D Transom Mount Combo. 12M Cables with 10-pin connector for sounder, 7-pin connector and a pigtail cable for the DFF3D. Furuno 165T-50/200-TM260 Literature Download Product Brochure. 15" COLOR LCD. Display unit. −15 ℃ to 55 ℃. Local Pick-Up Available - 33312. Screen Brightness. Bracket mount：7.4 kg. Flush mount：5.4 kg. 12-24 VDC, 4.5 - 2.2 A. This Furuno 1943C/NT Navnet VX1 Radar/chartplotter system is in great used condition. The unit uses C-map NT Wide Cards and was updated to the latest software for the best possible performance. RSB-0070-059 6KW Radar - good condition, a small amount of paint flake with minor scratches on the pedestal (pictured). Furuno 1935 Radar, complete. Condition is Used, but the transceiver was just sent to Furuno for a new magnetron and tested all good. This will perform like new. Includes display, antenna and cables. Furuno 7Pin 10 Meter data cable P/N 000-159-681. Condition is New.